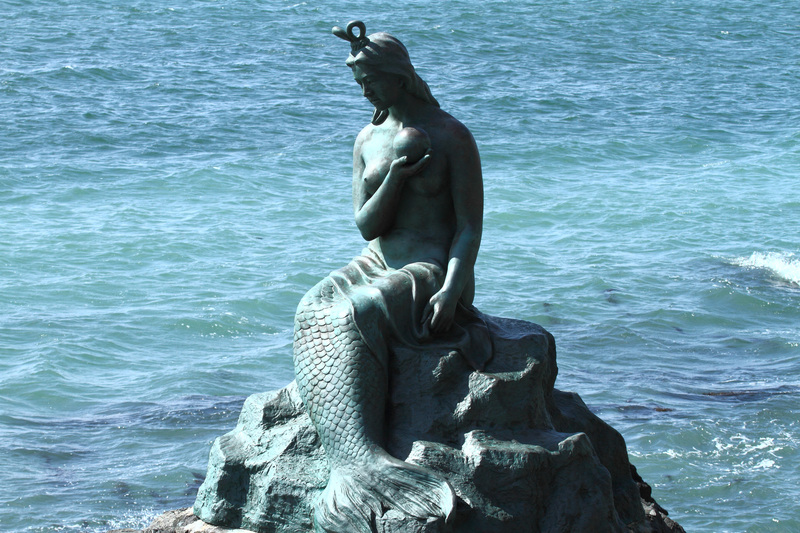 “Haplogroup Z arose on the high plains of Central Asia between the Caspian Sea and Lake Baikal. It is considered a characteristic Siberian lineage, and today accounts for around three percent of the entire mitochondrial gene pool found there. Because of its old age and frequency throughout northern Eurasia, it is widely accepted that this lineage was carried by the first humans to settle these remote areas. 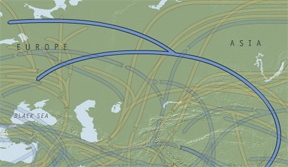 Radiating out from the Siberian homeland, haplogroup Z-bearing individuals began migrating into the surrounding areas and quickly headed south, making their way into northern and Central Asia. 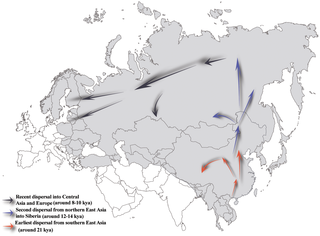 A frequency gradient of haplogroup Z is observed the further from Siberia one looks: it now comprises around two percent of the people living in East Asia. Heading west out of Siberia, however, this gradual reduction in frequency comes to an abrupt end around the Ural Mountains and Volga River. This provides a clear example of the impact geographic barriers have on human migration, and thus on gene flow and mixture. To the west of the Urals, this haplogroup is observed at frequencies less than one to two percent, both in northern and northeastern Europe.” In contrast, Ingman and Gyllensten’s 2006 study found Z in percentages up to 7.2 among Finnish Saami, and 4.3 among southern Swedish Saami. Surprisingly, although their total sample size for Norwegian Saami numbered 278, none of those were haplogroup Z. However, haplogroup Z did not make it far West for the most part, meeting a barrier around the Ural Mountains and Volga River – the reason why it traveled with the Saami people is probably because they were also a maritime whaling culture, and likely circumvented the mountains, perhaps by taking the arctic route going West. “In contrast to the predominance of European mtDNA haplogroups observed among the Saami, nearly half of their Y chromosomes share a TatC allele (haplogroup N3, according to the nomenclature of the Y Chromosome Consortium [YCC 2002]) with most Finno-Ugric and Siberian populations. This variant is found at high frequencies among Siberian populations, such as the Yakuts and the Buryats, but is virtually absent in western and Mediterranean Europe; even among the Norwegians and the Swedes, populations that have historically lived in close proximity to the Saami, it is found at frequencies of only 4%–8% (Zerjal et al. 2001; Passarino et al. 2002). High frequencies of the TatC allele have also been observed in Baltic (30%–40%) and Volga-Finnic–speaking populations (20%–50%) (Zerjal et al. 1997; Rootsi et al. 2000; Rosser et al. 2000; Semino et al. 2000; Laitinen et al. 2002). These findings have been interpreted according to the classic view that a substantial element of the Saami (and other European Finno-Ugric–speaking populations) genetic lineages originated in a recent migration from Asia (Zerjal et al. 1997, 2001). Haplogroup N3, the most frequent haplogroup in the Saami population, is distributed in eastern European and northern Asian populations but it is rare or absent in western Europe (table 3). All analyzed Swedish Saami N3 lineages fall into subcluster N3a, defined by M178 (YCC 2002). Although N3a is widespread in Siberia, other haplogroups, characteristic of Samoyedic-speaking and other Siberian populations (such as C and Q), are either almost absent in Baltic-Finnic populations, including the Saami, or are only sporadic, as for haplogroup N2, which is found only among Volga region Finnic speakers (table 3). In this respect, the Saami do not differ markedly from Finnic-speaking Karelians, Maris, Komis, Udmurts, or northern Russians, all of whom possess haplogroups of eastern Eurasian origin at similar frequencies (table 1). This minor part of the Saami mtDNA pool consists of two branches of the eastern Eurasian mtDNA tree—D5 and Z1. According to published data, the frequency of haplogroup D5 is relatively high in China (Yao et al. 2002). D5 is also present among Mongols and Siberians (Kolman et al. 1996; Derbeneva et al. 2002b). However, the Saami haplogroup D5 lineages, with the HVS-I motif 16126-16136-16360 and its derivatives (defined as “D5b” by Derenko et al. 2003), have been identified only in some northern and eastern European populations (among Karelians, Finns, Estonians, North-Russians, and Komis) and in some Siberian populations but not in Samoyeds (table 1). This suggests, again, the lack of gene flow from Samoyeds to eastern Europe. “Haplogroup Z stems from Central Asia between the Caspian Sea and Lake Baikal. It has its highest frequency in Russia and among some Sami groups. The Sami Z lineage shares a common ancestor with groups in Finland and the Volga-Ural area of Russia and must be quite recent (2,700 BP) because it differs from Northeast Asian Z representatives (Ingman and Gyllensten: 115, 119). Haplogroup N seems to have arisen in Northern China/Mongolia from where it spread into Siberia and the Baltic. Its descendant N1c is widespread in the Baltic region and was brought by small groups of males speaking an early Uralic language. There is a clear distinction between the Eastern Finns and the Sami vs. those living further to the west with the former having high values of N1c. Österbotten in Western Finland, though, has a very high frequency too; this could be related to contacts with Norrland as above. North Norway has a higher value than most other majority groups, with the exception of Finland, and this may be due to admixture with the Sami. Three areas of Sweden show fairly high values with an east-west cline, 3.6% for Götaland to the south and 7.9% for Svealand just north of Götaland and Gotland off the east coast of Sweden with 10%. Surprisingly, perhaps, the figure for Norrland is only 6.5% whereas Västerbotten has 19%. Lappalainen et al. suggest historical ties to Finland where N1c is very common (2009: 70). Berit Myhre Dupuy et al. mention that the Y-chromosome N3 in Norway “is observed at 4% in the overall population and at 11% in the northern region corresponding to 150,000 and 50,000 inhabitants, respectively. These numbers exceed the total number of Saami inhabitants” (2005: 6). Dupuy et al. continue: “There is thus a considerable pool of Saami and/or Finnish [Kven] Y-chromosomes in the Norwegian population and particularly in the north (ibid. 6,8).” 4% of Norway’s population of ca. 5 million would be 190,000, the number of Norwegians carrying N1c. Another theory proposes that Haplogroup N arose in Africa, made it to Western Eurasia and spread from there. In Europe only 0.2 of the population belong to haplogroup N. The carriers of haplogroup N are mainly situated in Central Europe. In Africa haplogroup is found throughout the African continent. In Africa the populations carrying haplogroup N belong to almost all the language families spoken in Africa including Cushitic, Nilo-Saharan, Khoisan , Niger-Congo, and Semitic. The craniometric and molecular evidence fails to support the hypothesis that haplogroup N entered Africa as a result of back migration. The presence of the N haplogroup among Sub-Saharan populations from the Nile basin, into West Africa, NorthEast Africa and East African corresponds to Ehret’s  hypothesis that the major contemporary African language families probably originated in one composite region extending from the Nile Basin to the Ethiopian highlands. It appears that the Khoisan speakers took haplogroup N to western Eurasia. The molecular and craniofacial evidence makes it clear that the Aurignacians and many early farmers in the region were direct migrants to the Levant and Europe from Africa [3,8]. Moroever, the identification of Sub-Saharan craniometric features [3,4,11] and the N haplogroup among ancient skeletons [5,11] suggest that the ancient Sub-Saharans in the Levant and Europe already possessed haplogroup N ( when they arrived in these areas from Africa. This is supported by the fact that anatomically modern humans did not replace Neanderthal people in the Levant until after Cro-Magnon people has established the Aurignacian culture in Spain and France . The craniometric evidence that the Aurignacians , Natufians [4,13] and other groups who inhabited the Levant and Europe belonged to Sub-Saharan populations at this time suggest that these farmers carried haplogroup N into western Eurasia between 40,000-7500 ybp and confirms Quintana-Murci et al  hypothesis that haplogroup N originated in Africa. An analysis of Cro-Magnon DNAindicates that they belonged to haplogroup N .
The Cro-Magnon mtDNA is associated with the Paglicci-12 . Paglicci-12 show the motifs , 00073G, 10873C, 10238T and AACC between nucleotide positions 10397 and 10400 . This classifies the sequence into the macrohaplogroup N. According to Caramelli et al  a mutation in 16223 within HRV1 suggests a classification of Paglicci-12 in the haplogroup N*. Caramelli et al  discovery of Cro-Magnon mtDNA confirms the research of Boule and Vallois . This is confirmation of Boule and Vallois , because the Khoisan carry haplogroup N , the L3(N) haplogroup that was also found among the Cro-Magnon people. Early farmers of the Levant and Europe show Sub-Saharan craniofacial features [4,13].There is other evidence of a predominantly Sub-Saharan population formerly existing in the Levant. Trenton W. Holliday , tested the hypothesis that if modern Africans had dispersed into the Levant from Africa, “tropically adapted hominids” would be represented in the archaeological history of the Levant, especially in relation to the Qafzeh-Skhul hominids. This researcher found that the Qafzeh-Skhul hominids (20,000-10,000 BC),were assigned to the Sub-Saharan population, along with the Natufians samples . Holliday  also found African fauna in the area. Holliday  confirmed his hypothesis that the replacement of the Neanderthal people in the Levant were Sub-Saharan Africans. This finding was similar to Brace et al findings for the Levant and Europe . The founders of civilization in Levant were the people, archaeologists call Natufians. Clark  claims that the Natufians originated in Africa. By 13,000 BC, according to J.D. Clark  the Natufians were collecting grasses which later became domesticated crops in Levant and European. In Palestine the Natufians established intensive grass collection. The Natufians used the Ibero-Maurusian tool industry . These Natufians , according to Christopher Ehret were small stature folk who spread agriculture throughout Nubia into the Red Sea (1979) and thence into North Africa and Europe. …These early European farmers fail to share haplogroups found among the contemporary Europeans. Ancient DNA found in the ancient skeletons belonging to this period belong to the N haplogroup. (Haak et al., 2005). Haak et al., 2005 has discussed the identification of N1a in ancient Europe. 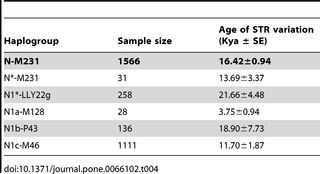 These researchers report between 8 and 42% of the early farmers belonged to the N1a lineage. Today the percentage of Central Europeans who belong to N1a lineage is only 0.2%. The findings of Brace et al. and Holiday  suggest that the Old Europeans may be related to African cattle raising farming groups. This supports the idea that ancient Eurasian farmers originally from Africa and the Middle East may have planted the seeds of agriculture in ancient Europe, since Boule and Vallois , and Brace et al. have shown that the Aurignacians and the Natufians have a clear link to Sub-Sahara Africa. For an understanding of how hg N expanded, see FIGURE 2: GContour maps of Hg N sub-haplogroups. 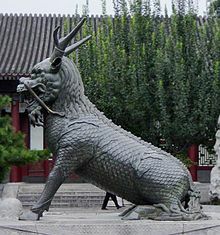 The puzzling questions I have here, are, if the first/early European Neolithic farmers N1a were the oldest lineages (i.e., if they were the oldest lineages of N), when and how and by which route did hg N make it to Southeast Asia before making the anti-clockwise route back to Central Asia and back to Europe? Fascinating. My family has been in Northern Ireland since about 1640 yet our paternal ancestry has been identified by DNA as mainly Evenk, Chukchia and some Ket and Sami.